Photos by Heather Ziegler It was an exciting day at Warwood School on Wednesday when the Pittsburgh Pirates, the Grable Foundation and Chevron came to honor middle school teacher Josh Yost. Shown from left are Ohio County Schools Superintendent Kimberly Miller; Warwood School Assistant Principal Jim Rowing; Ohio County Schools Innovation Coordinator JoJo Shay; Pirates Charities Coordinator Sarah Jugovic; Chevron Corporate Affairs representative Lee Ann Wainwright; honoree Yost; the Pirate Parrot; Warwood School Principal Joey Subasic; and Ohio County School Assistant Superintendent Rick Jones. 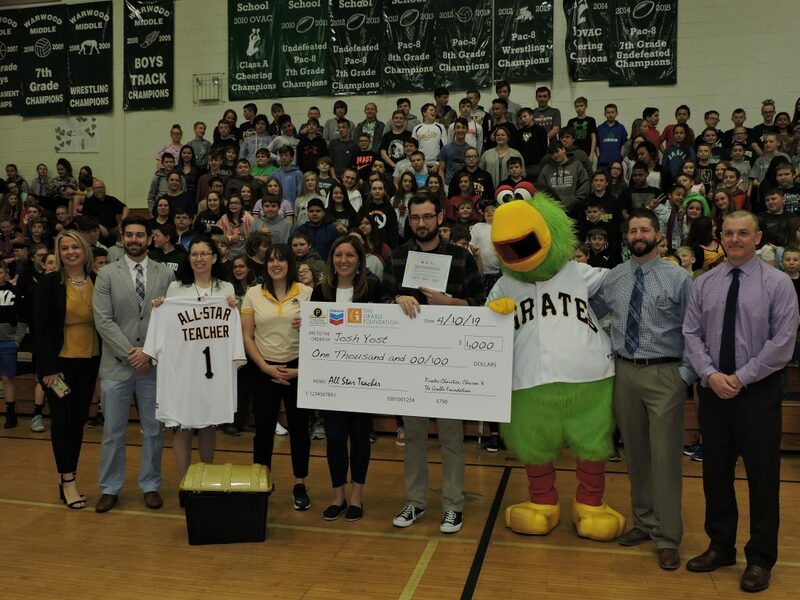 WHEELING — Three local middle school teachers were surprised when the Pittsburgh Pirate Parrot, officials from The Grable Foundation and Chevron entered their schools on Wednesday to bring them well-earned honors. At the Warwood School, middle school teacher Josh Yost was overwhelmed with emotion when he was named one of the three teachers honored. The other two honorees included Marshall County teachers Mindy Thomas at Sand Hill Elementary and Suzanne Muncy at Moundsville Middle School. They, too, received surprise visits Wednesday. The three local teachers were among 18 out of hundreds nominated for the honor. Each teacher received $1,000 to spend in their classrooms, $50 spending money, a personalized Pirates jersey, a trip to a Pittsburgh Pirates game in August where they will be honored on the field, and a host of Pirates’ memorabilia. Most of all, each received the gratification of knowing they are appreciated by their students, fellow faculty and all those they work with each day. Students and teachers at the Warwood School were told they were meeting for an assembly concerning school rules Wednesday morning. Then Pirates home game announcer Joe Klimchak entered the gym and explained the reason for his visit. He was joined by team mascot, the Pirate Parrot. Yost said he was “stunned, shocked and amazed” by the honor. “The real winners are the students. I care so much about them. This job means everything to me,” Yost added. Stacy Olson, president of Chevron Appalachia, said, “This region has incredible teachers who do amazing things in and outside the classroom that so often go unnoticed.